If you have ever sent your knights into battle carrying their shields with your family's crest, or your domain's colors, then you will easily understand escutcheons. They are nothing other than stone embodiments of your shields, or crests. In some Italian towns, one can still see colorful escutcheons high on a palazzo's stuccoed facades. In New York, however, the preferred color is gray, usually in limestone, or, more rarely, terracotta, and the preferred "field" is blank more often than not. 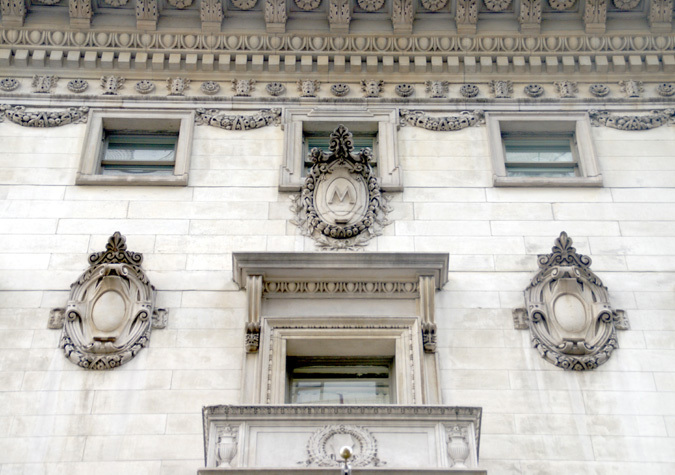 The Metropolitan Club on the northeast corner of Fifth Avenue and 60th Street, has three escutcheons on its side-street façade and the center has a large "M."
Many escutcheons with rather blank faces, however, are quite ornamental with curlicues, or garlands, or supportive figures. If one walks around the city's precincts of pre-war, luxury apartment buildings, one is likely to espy quite a few escutcheons if one is willing to crane one's neck. Escutcheons are merely decorative elements meant to enliven broad expanses of facades and impart a sense of courtliness. Stringcourses and bandcourses, of course, horizontally enliven facades, a pre-magic-market form of brushstroking and highlighting, but in most cases they are continuous and tend to be placed above the "base" of a building and near the top. They have vertical counterparts in piers and quoins, the former usually received for the middle section of facades and the quoins almost always exclusively are found at the corners. The various "courses" and piers and quoins are, of course, always tucked beneath a building's cornice at the roofline, and these elements give accents and rhythm and punctuation to the facades just as much as the pattern of windows, known as fenestration. The escutcheons are usually brought in only in a desperate attempt to jazz up a bland or massive façade, or merely to add an appearance of noble heritage.